The inspiring 10,000+ strong March for Choice on 28 September made a very clear statement – we can’t wait, repeal the 8th! 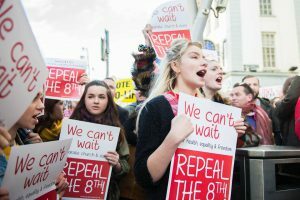 There is widespread support for the lifting of Ireland’s dangerous and discriminatory constitutional abortion ban. The Irish Examiner reported that 64% of farmers are now in favour of repealing the 8thamendment. A previous Amnesty International poll indicated that 81% of the population are in favour of a widening of abortion availability, requiring a referendum. Over 16,000 women have had to travel to England over the last four years of the Labour/Fine Gael government. 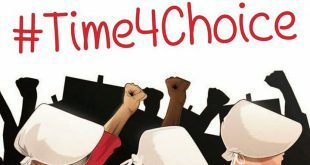 Despicably, the legislation this Government passed in 2014 further criminalised women who access an illegal abortion in Ireland, with a potential sentence of up to 14 years in prison. Many women face restrictions on their travel; sick women, like Savita Halappanavar and Michelle Harte who died after being denied abortions in Ireland, migrant women, rural women, young women and poor women. 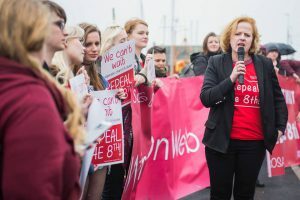 WomenOnWeb.org is a heroic and life-saving Netherlands based organisation run by pro-choice doctors. 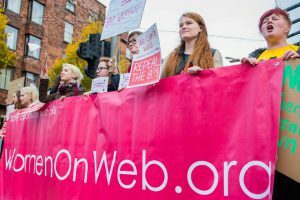 After an online consultation with a doctor, women in Ireland and other countries with abortion bans can access an early safe, illegal abortion by receiving abortion pills through the post that they can then use at home, once they have a friend with them and are able to access a hospital should any complications arise. These pills are on the World Health Organisation’s list of essential medicines. They are safer than Viagra. 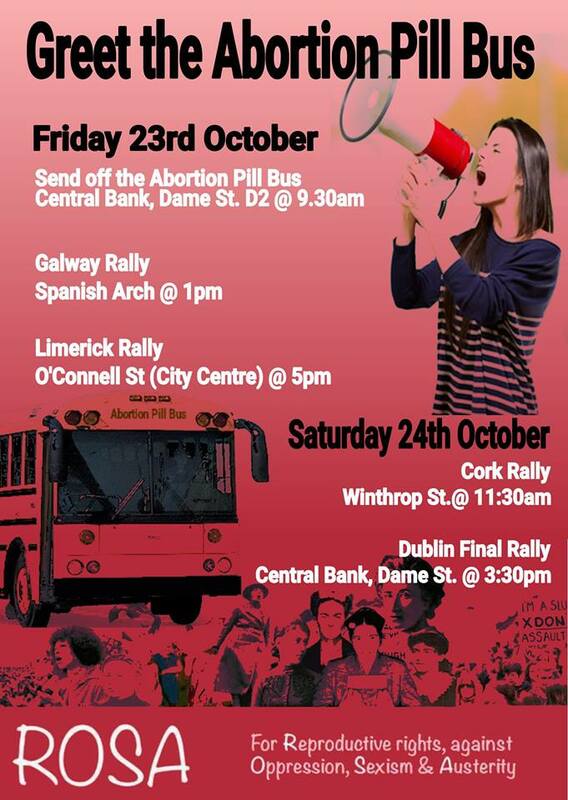 The Abortion Pill Bus, organised by ROSA and Ruth Coppinger TD in conjuction with WomenOnWeb.org will be defying Ireland’s unjust and dangerous abortion ban. Travelling to Galway, Limerick, Cork and Dublin, the bus will have a private consultation room with a WomenOnWeb doctor and the consultation will be carried out via Skype. 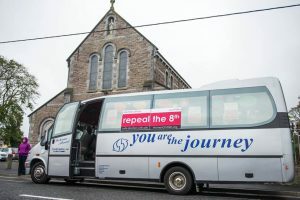 The Bus will be carrying the Abortion Pills and will provide women with the help they need in this country, rather than forcing them to travel at huge expense, and with extra personal trauma, to access the healthcare they need. 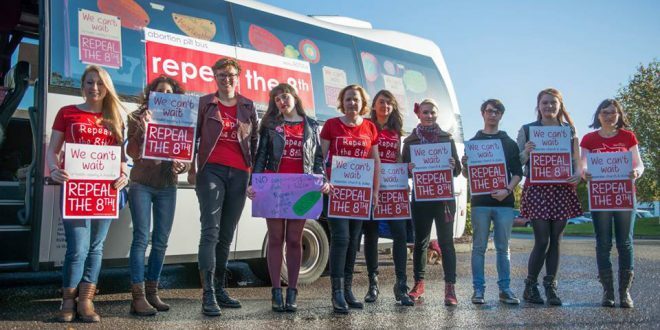 As a General Election approaches we are sending a message to the political establishment that they cannot ignore – women cannot and will not wait any longer for health and human rights – we demand a referendum to repeal the 8th.